Diabetes is classified into three types: type 1, type 2 and gestational diabetes. Type 1 diabetes develops when the pancreas, which is located behind the stomach, is unable to produce proper levels of insulin. Type 2 diabetes, or often called insulin resistance, occurs when body cells are unable to respond properly to insulin. Some of the most common causes of this diabetes type include overweight, unhealthy lifestyle and inadequate exercise. Lastly, gestational diabetes occurs when pregnant women who do not have diabetes history, suddenly experience high blood sugar levels. Diabetes is a serious health condition that claims thousands of lives every year. Fortunately, there are many natural ingredients and methods you can do at the comfort of your home to prevent and control diabetes. One of the most common causes of diabetes is lack of exercise, which is an effective natural method to minimize symptoms of diabetes while also decreasing possible long term effects. In addition, regular exercise helps in maintaining proper weight and fight obesity, which is also a leading diabetes cause. Daily exercise reduces high cholesterol levels, thus lowering blood sugar level. Furthermore, exercising is also linked with increased sensitivity of the body to insulin, which targets type 2 diabetes problems. One of the easiest exercise routines is brisk walking or light jogging. Wake up early and walk or jog around the neighborhood every day. It is also recommended to breathe fresh air while doing these exercises so try to pick a location that has no air pollution. Another effective exercise is doing yoga sessions to relax the mind and body. You can enroll in yoga group therapy sessions to increase the urge to exercise. Another leading cause of developing diabetes is eating unhealthy food items. Too much consumption of fatty and sugary foods greatly impacts the health of diabetic people. A suggested diet if you want to prevent or control diabetes is called whole sum diet, which includes fruits and vegetables that provide high levels of antioxidants such as vitamin C.
Eat a piece of orange, apple or a few slices of pineapple during breakfast. You can also make healthy shakes and drink while eating your favorite morning food. Blend one peeled orange with a few slices of pineapple and apple. Add 1 glass of water and 1 teaspoon of honey. You can also use shaved ice. Drink every morning or before going to sleep. Aside from these healthy shakes, you can also take vitamin c supplements, which are readily available in drugstores. The suggested daily dosage intake is 1000 mg. Proper diet means regular consumption of natural uncooked vegetables and fruits including sprouts, lettuce and many more. These natural food items provide high levels of healthy enzymes and antibacterial properties that help control diabetes. In addition, natural foods are free of chemicals that can potentially add to the risks of developing diabetes. Fiber helps the body in proper sugar absorption, which is especially needed by people who have sweet tooth. When suffering from diabetes, daily consumption of fiber helps the body to slowly metabolize sugar, thus developing high blood sugar levels is prevented. To maximize the effects of fiber, consume food items that have high soluble fibers such as apples, berries, carrots, and most citrus fruits. Furthermore, soluble fiber has been proven to effectively control high LDL cholesterol levels, which is common in diabetic people. Aside from controlling unwanted weight gain, green tea is rich with polyphenols, which effectively control and maintain proper sugar levels. Green tea is also popular for its antibacterial effects. Get 1 fresh green tea bag and dip in hot water for about 5 minutes. Add 1 tablespoon of honey and a few drops of lemon. Drink twice a day, in the morning and before going to bed. Over the years, reflexology therapy has gained popularity as a natural remedy for diabetes. It is now considered as an effective way to promote healthy pancreatic cells that are responsible in producing insulin. Reflexology sessions specifically target the endocrine system and pancreas to optimize insulin production especially for people suffering from type 1 diabetes. The liver organ is also targeted to improve its functions as it is one of the many organs affected by high blood sugar levels. It is important to get these sessions from professional and accredited reflexologists to avoid further complications. To be on the safe side, ask professional service from reputable hospitals. 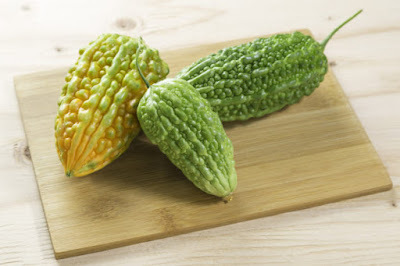 Also known as bitter gourd, bitter melon is packed with glucose lowering properties that help maintain proper blood sugar level. It has been proven to target not just a few organs, but the whole body with regards to maintaining healthy glucose metabolism. Due to the fact that bitter melon also promotes better production of pancreatic insulin while also minimizing insulin resistance, it is effective for both type 1 ND type 2 diabetes. Slice a piece of bitter melon into two portions. Remove the seed and directly consume. If you can’t tolerate the bitterness, prepare as a shake. Blend with a cup of water or shaved ice and add 1 teaspoon of honey. Drink every morning during breakfast for at least two months. You can also drink before going to bed. You can also include bitter melon to your favorite home cooked meals. Most people consider mango as a perfect desert or an added ingredient in salads. Aside from providing nutrition, mango leaves can also help treat diabetes by maintaining proper insulin production especially for type 1 diabetes patients. In addition, mango leaves are packed with healthy ingredients that promote better lipid profiles. Thoroughly wash and clean 10 to 20 mango leaves using running water. Make sure to pick the freshest leaves. Soak overnight in lukewarm water. In the morning, remove the leaves and filter the mixture. Drink a glass on an empty stomach. Wait for 30 minutes before eating breakfast. You can add a teaspoon of honey and a few drops of lemon to improve taste.